As the name implies, seasonal pricing is set at a fixed price for the entire season and billed equally over the winter months. This is a popular choice in areas where the region experiences seasonal snowfall averages of at least 15 inches. As with any of the pricing models, there are pros and cons to seasonal pricing. With seasonal pricing, should the region experience a mild winter, income would be secured for those winter months regardless of the number of snow events that take place. However, should the region experience an above average winter, diminishing profit margins could result if services are provided beyond the seasonal rate the bid was calculated on. Another piece of the equation to mention here is the customer’s perceived value of seasonal pricing. It’s safe to say that customers will find greater value in this service during above to normal snowfall years but during below normal years they may experience more dissatisfaction. However, for long term customers, they often see the value in this option as they are better able to budget for their snow removal services on a yearly basis. Event pricing is defined as fixed pricing per snow event based on the number of inches of snowfall for a single storm. With this option, service will begin at a pre-determined snowfall level set by the customer, and service will continue throughout the event until the weather conditions subside and the property is clear and safe. Because the event pricing is preset there is no guessing at what the costs will be and the snow removal contractor provides monitoring of the lot throughout the snow event.This is a popular option for customers that have lot sizes greater than 50,000 square feet. Per event pricing allows the customer to only pay for the service when the event happens compared to locking in at a fixed seasonal contract rate. 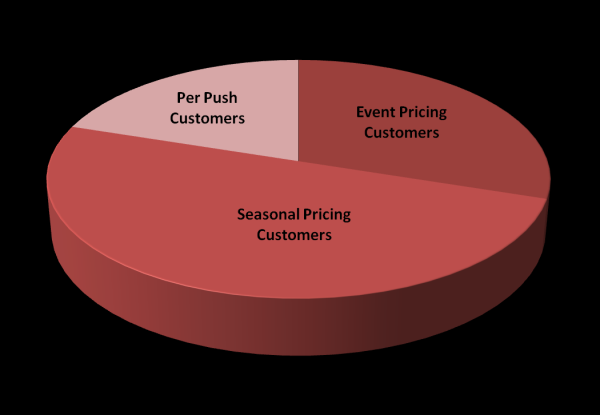 In an above average snow year, the diversification of event pricing customers is advantageous as the extra income earned can help offset the potential profit loss with seasonal contracts. For customers this can be a more challenging item to include in their budget as it can fluctuate based upon the number of snow events in that given year. On the flip side, during a mild winter, having seasonal contractors can help offset the loss of income from the lack of snow events and customers with event pricing contracts. Per push pricing is a fixed rate per service. This proves to be a popular option for customers with lot sizes less than 50,000 square feet and typically require less than one hour of service to complete. In this case, the customer pays for the number of times you clear the lot during a snow event at your per push rate. Similar to event pricing, the pros and cons of this type of pricing are reflected in the amount of snowfall during that particular season. The more events, the more payments/income you will earn. The above models provide a snapshot of the pricing models that are common to the snow removal industry. When setting up contracts, consider these models and talk to your customers and/or potential customers about what works best for their business. Educate them on the benefits and risks of each plan and help them to make the best decision for their business. Aligning yourself with a variety of customers with different pricing plans will help you “weather” whatever Mother Nature has in store for the upcoming season.